Polyplus-transfection® has developed a novel class of cationic modified oligonucleotides (OLIGOPLUS) that require no delivery agent as they act as cell-penetrating oligonucleotides. This is achieved by grafting cationic spermine units onto the oligonucleotide to create a positively charged oligocation-oligonucleotide conjugate. 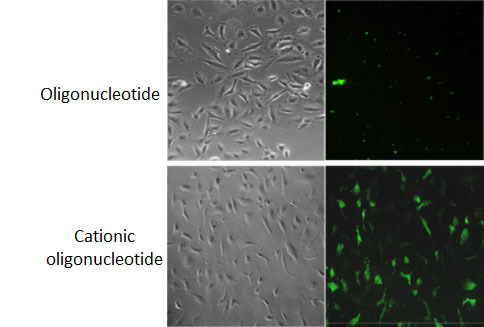 The conjugate molecules, highly stable, do not require formulation with a vector for successful delivery into target cells. This technology can apply to different classes of therapeutic oligonucleotides such as siRNA, antisense and anti-miR. In the case of siRNA, a sub-class called SIRNAPLUS® have been developed and fully characterised. SIRNAPLUS® conjugates are active in the presence of serum and have shown specific gene silencing activity at low nanomolar concentration. Their in vivo efficacy is currently under review in a study of gene silencing activity in neuronal progenitor cells in mouse brain, in xenograft tumors and lung metastasis models. The technology is now fully available for licensing for a wide range of indications and applications. What are OLIGOPLUS and SIRNAPLUS®? Oligonucleotides are polyanions that cannot enter living cells on their own due to their negative charge state. Oligonucleotides may become a very selective class of drugs for the treatment of a vast palette of diseases. However, as drug candidates, they must be delivered into target cells. Standard oligonucleotides are usually formulated into particles using cationic polymers or lipid compounds in order to improve their delivery. However, these particles intrinsically have limited access to certain organs due to their significant physical size. OLIGOPLUS is a novel class of cationic modified oligonucleotides developed by Polyplus-transfection, and that require no delivery agent as they act as cell-delivering oligonucleotides. This is achieved by grafting cationic spermine units onto the oligonucleotide to create a positively charged oligospermine-oligonucleotide conjugate. These new cationic oligonucleotides are produced using the standard phosphoramidite chemistry via automated solid phase synthesis and a spermine phosphoramidite derivative (Voirin et al., 2007). These positively charged oligonucleotides are highly stable molecular conjugates and have a size of a few nanometers, which is close to the size of an oligonucleotide. Such cationic oligonucleotides are thus able to diffuse and to bind the cell membrane, inducing an endocytosis and transport in the cytoplasm (Nothisen et al., 2009). Self-delivering of 3’-fluorescent cationic oligonucleotide (19-mer, 5‘-conjugated to oligospermine) in HeLa cells. As control, the 3’-fluorescent 19-mer oligonucleotide used at the same concentration was not internalized by the cells (Nothisen et al., 2009). This technology can apply to different classes of therapeutic oligonucleotides such as siRNA, antisense and anti-miR. In the case of siRNA, a sub-class called SIRNAPLUS® have been developed and fully characterized. SIRNAPLUS® conjugates are stable, active in the presence of serum and have shown specific gene silencing activity at low nanomolar concentration. Their in vivo gene silencing efficacy is currently under evaluation, in xenograft tumor and lung metastasis models, and in neuronal progenitor cells in mouse brain. What are the applications of self-delivering cationic oligonucleotides? Self-delivering cationic oligonucleotides (OLIGOPLUS) can be produced and used for antisense, gene silencing or antigene applications when single stranded DNA oligonucleotides are conjugated with an oligospermines tail. The grafting of oligospermine tails to double stranded RNA allows the synthesis of SIRNAPLUS® or cationic miRNA for RNA interference applications. Self-delivering cationic DNA oligonucleotide-oligospermine conjugates can serve as eﬀective antisense and antigene agents. Antisense conjugates containing DNA and locked nucleic acid (LNA) oligonucleotides were shown active at nanomolar concentrations in a model of Huntington’s disease (Gagnon et al., 2011). Other cationic DNA conjugates targeting the promoter of the progesterone receptor (PR) function and acting as antigene agents were shown to block PR expression in the nucleus (Gagnon et al., 2011). These observations support further investigation of such conjugates as DNA-based silencing agents or the developments of novel oligonucleotides for other approaches as anti-miRNA or exon-skipping. – Specific gene silencing activity at low nanomolar concentration in vitro and in the presence of serum (Paris et al., 2012) or at 1 mg/kg in mouse models. Improved diffusion of fluorescent SIRNAPLUS® in subcutaneous melanoma B16-F10 tumors after intratumoral injection of cationic siRNAs. Voirin, E., (2007) Versatile synthesis of oligodeoxyribonucleotide-oligospermine conjugates. Nat Protoc, 2, 1360-1367. Nothisen, M., (2009) Cationic siRNAs provide Carrier-free gene silencing in animal cells. J. Am. Chem. Soc., 131, 17730-17731. Paris, C., (2012) Conjugating Phosphospermines to siRNAs for Improved Stability in Serum, Intracellular Delivery and RNAi-Mediated Gene Silencing. Mol Pharm. 9 (12), 3464–3475. Gagnon, K., (2011) Antisense and Antigene Inhibition of Gene Expression by Cell-Permeable OligonucleotideOligospermine Conjugates. J. Am. Chem. Soc., 133(22): 8404-8047. OLIGOPLUS are the subject matter of U.S. Patent No. 9090648, European Patent No. 1 973 927 and foreign equivalents entitled “Cationic oligonucleotides, automated methods for preparing same and their uses”. SIRNAPLUS® are the subject matter of Patent Application WO/2009/095887 entitled “Cationic siRNAs, synthesis and use for RNA interference”. We are actively seeking partners to license OLIGOPLUS and SIRNAPLUS® for a wide range of indications and applications. For licensing opportunities, please visit our webpage dedicated to Licensing Opportunities or contact us. Custom cationic oligonucleotides are available from Metabion. Spermine Phosphoramidite is available from Glen Research. More information in the Glen Report « Spermine Phosphoramidite: A potent modification with many applications ».